HEINRICH VON HERZOGENBERG (1843-1900): 3 String Quartets, Op. 42, JOHANNES BRAHMS (1833-1897): String Quartet, Op. 51/1. 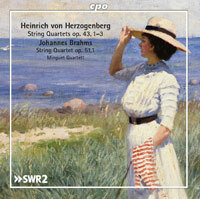 Description: Herzogenberg’s second through fourth quartets were published in 1884. The first two are large-scale works on a symphonic scale, the first a relaxed and lyrical piece like a youthful Brahms serenade and the second more unsettled and anxious but only slightly; they each last 36-37 minutes. Then comes the equivalent of the ancient Greek drama’s satyr play - a 24-minute example of classical concision which updates Haydn and Mozart for the late 19th century. Only Op. 42/1 has appeared on CD before and it’s the one where the scherzo has a strong melodic and rhythmic resemblance to the same movement in its Brahms disc-mate (written in 1873). 2 CDs. Minguett Quartet.